This has become my latest favorite "quick" meal. It does take a bit of time to chop the vegetables, but if you plan to make it several times during a week, you can cut the veggies all at once and make extra rice to save for the later meals. That way it's just a quick cook and you have a yummy, hearty meal. Another great thing is that you can adapt it and use whatever veggies you happen to have on hand. Prepare rice according to package directions. Heat olive oil over medium high in a skillet. Add peppers, onion and carrots. Sautee several minutes until starting to brown. (While cooking, place rice in bowls.) Add garlic, ginger, salt and pepper. Cook 30 seconds. Add spinach and stir until wilted. 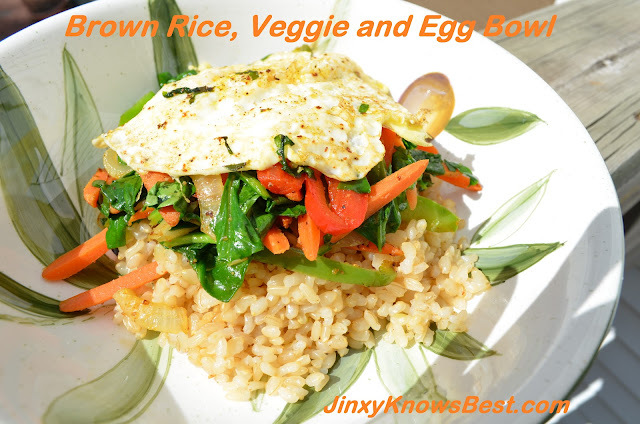 Place veggies on top of rice in bowls. In same skillet, crack two eggs. Fry each as desired (I like to crack the yokes and cook them firm, but make them as you like.) Place a cooked egg on top of each bowl. Serve with soy sauce. Stumbled and Pinned for you cuz this looks Delicious!!! Looks delicious. I am always on the lookout for new vegetarian dishes for the hubby and me.